4 years ago, I started working on my Goemon 3 translation project. Recently, I've made a lot of progress on hacking Goemon 3 and perfecting the compression tools. In this thread, you can check the progress of Goemon 3 translation project. Most of the work done so far has been hacking and tool related. I've programmed a decompressor and a compressor for the graphics. Hacking wise, lately I've been working on perfecting my VWF code. Once I complete the text tools, I'll begin looking for a translator. Fantastic to hear. This one is the most text heavy of the super famicom entries as I recall, but cracking the text format has been the main snag for any of them. Supposedly Goemon 4 uses similar compression, are you thinking of looking into it afterwards? Or maybe at least releasing your source code so someone else could take a crack at it. 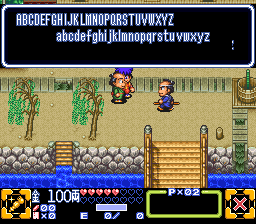 It''s true that the text in Goemon 3 is compressed. Both the graphics and text are compressed with an LZ variant. I've looked at the other SNES Goemon games and they use almost identical compression schemes. This is great news! This is on the top of my wishlist for game translations. Best of luck! By the way, in case you didn't know, I'll drop this link just in case: this youtube user made a series of videos translating (most of?) the main story scenes from Goemon 3 and 4. The videos are very old (2008), but maybe you could try getting in touch with him. I just realized, I've seen you talking about this project in the acmlm forum years ago! I'm happy to see you're still at it! Please keep it up! Hey. It's pretty nice to see that you're working on VWF coding. That's still a worthy goal and your work does look good and I appreciate your enduring enthusiasm in this series. Hang in for the long run! By the way, have you contacted Avicalendriya regarding his work on a translation for the Goemon series on the SFC? I am not sure if he did anything for the last two SFC Goemon games before retiring for good from the scene. But might be worth an ask. Considering the unfortunate history of SNES Goemon projects, how about going a different route with this one? Like, creating a wiki or a spreadsheet on google docs where the japanese script is dumped and the community can freely help translate and refine the english version? It could could even begin with a machine translated version to get things going. I'm wondering if there could be also a github project where people could even insert the script in the right rom addresses or something. Congrats on the project. How did you solve the main issues that plagued this game that prevented translation at first? The hardest part about 'translating' a game is not the actual script translation. It's the hacking that bring projects to their knees. The problem with the Goemon games is not that no one translates the scripts, or that they get lost. The problem is the hacking, the compression, the inserting, and all the tedious boring time consuming tasks you have to do to make it work. Now this guy Rai apparently finally figured out the compression, so the impossible task is now possible, but still time consuming. The good thing is that once he releases his tool, any other hacker can use it to translate the other games. Thanks for the comment. I haven't contacted Avicalendriya yet. I got around the main issues by programming my own compression tools. The compression is mainly what has prevented this game from being translated. It's true that the actual hacking is the hardest part of translating a game. Without the proper tools; a game like this would be impossible to translate. The actual compression the game uses is not that complicated. It uses a combination of LZ77 and RLE. The compression also has what I would call "zero byte pairs". Basically a compressed string like "0x50" can be decompressed to "0x00,0x50". Recompressing LZ77 pairs is kind of difficult. The LZ77 pair needs to decompress to correct length and offset. So I had to add a routine for calculating the right "length, offset" pair to my compressor. I dare ask, but are you also working on the started but abandoned Ganbare Goemon 2 SFC translation? That one is a platformer and my personal favorite of the trilogy. Hmm. Avicalendriya did say on another thread here that he'd given all of his Goemon series work, particularly the graphical hacks on Ganbare Goemon 2, over to a romhacker known as 'ddstranslation'. But that person is busy with his own project(s). So maybe when Rai here would complete his conversion tools for handling the text and tiles he could contact ddstrans to offer his tools and instructions for opening up the ROM file of GG 2? Good idea, no? Edit: Yes, both of you visited that thread, too. It shouldn't be a problem then. It just depends on one romhacker contacting another peer once all is said and done! If I work on Goemon 2, I'll probably start from scratch. It's easier that way. I've made a lot of progress on the script dumper for Goemon 3. I'll probably start looking for a translator pretty soon. It's great to see that DDSTrans is working on Goemon 2. Hopefully Goemon 2's script isn't compressed or as control code heavy as Goemon 3's. Hopefully they don't use that font either! The likely has numerous fonts.